This book was first published in 2006. Earth's atmosphere and oceans exhibit complex patterns of fluid motion over a vast range of space and time scales. These patterns combine to establish the climate in response to solar radiation that is inhomogeneously absorbed by the materials comprising air, water, and land. Spontaneous, energetic variability arises from instabilities in the planetary-scale circulations, appearing in many different forms such as waves, jets, vortices, boundary layers, and turbulence. 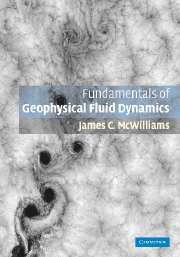 Geophysical fluid dynamics (GFD) is the science of all these types of fluid motion. This textbook is a concise and accessible introduction to GFD for intermediate to advanced students of the physics, chemistry, and/or biology of Earth's fluid environment. The book was developed from the author's many years of teaching a first-year graduate course at the University of California, Los Angeles. Readers are expected to be familiar with physics and mathematics at the level of general dynamics (mechanics) and partial differential equations. Preface; Symbols; 1. Purposes and value of geophysical fluid dynamics; 2. Fundamental dynamics; 3. Barotropic and vortex dynamics; 4. Rotating shallow-water and wave dynamics; 5. Baroclinic and jet dynamics; 6. Boundary-layer and wind-gyre dynamics; Afterword; Exercises; References; Index.